An unexpected and unplanned day off arising from several projects concluding earlier than anticipated, with a gap until the next ones begin next week. Jon kindly agreed to hold the fort whilst I had a day in London, away from Association and West Kent politics. First off was a text from our excellent printer, Jason Allen, to ask if I wanted to see the plates about to roll on the machines. As I was literally two minutes away from his print works I popped in. Looking for gravy stains on the candidate's tie! 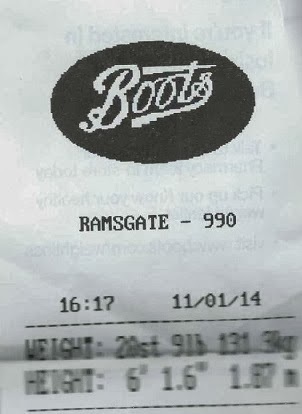 I then stopped off in Rochester to renew my car tax, whilst there bumping into a local councillor who was keen to talk about local government selection rules. "Come and have a coffee". I then drove to West Malling to pick-up my dry cleaning and jump into the train to Victoria, narrowly avoiding a certain former MP in the carriage ahead! I did, however, find myself sitting opposite one of Labour's SE Regional Organisers - so we spent the journey gossiping about the people we both once knew! Walking down Victoria Street I bumped into the charming Stephen Parkinson (who ran the national NO to AV campaign and is now the Home Secretary's Special Advisor). I then met with Matthew Plummer from Wandsworth who wanted to chat over coffee about his campaign and life in general. I left the coffee shop to walk to Borough Market - and promptly bumped into James Cleverly (London Assembly Member for Bromley). After pleasantries I walked on to Borough Market and chanced to meet a former Agent who now works for Stonewall, "I'm just about to have coffee with someone you know (naming the ex-partner of an MP we both knew) why don't you join us? Finally, laden with bags of exotic fruit which I could have bought for half the price in my local Waitrose, and wide-eyed with caffeine, I decided to walk back to Victoria - bumping into yet another former agent on Westminster Bridge, who now works in public affairs. And that was my day away from politics - though I did manage to bring home so delicious monk-fish for dinner ! Does this mean our Office Manager is considering dipping his toe into the political arena? Cllr Botten perhaps? I hope he sends in his copy on time as it would be awful if he had to send himself emails complaining about missing the deadline! 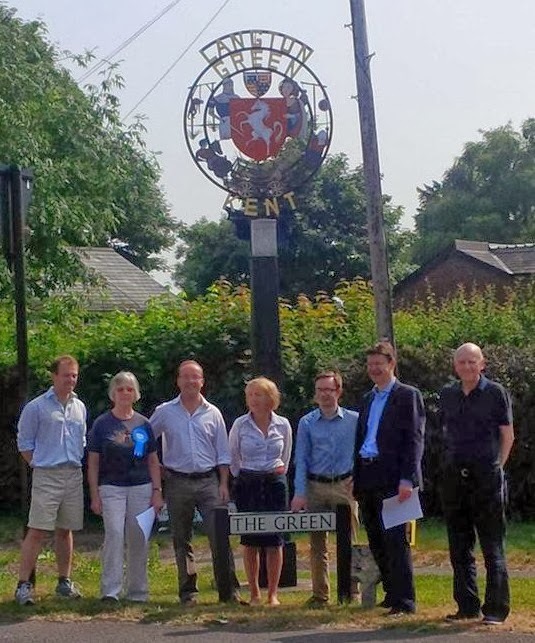 Chatham & Aylesford MP Tracey Crouch along with local Conservative Councillors Dave Davis and Roger Dalton, launched a "consultative referendum" this morning, asking people in the village of Wouldham for their thoughts on housing development. 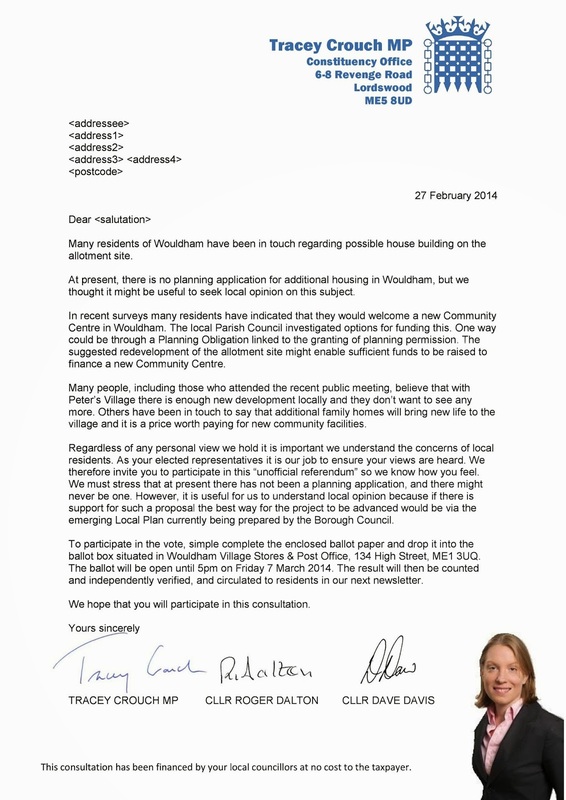 Every resident has been sent a letter from Tracey and the local councillors along with a ballot paper asking for their views of various options. 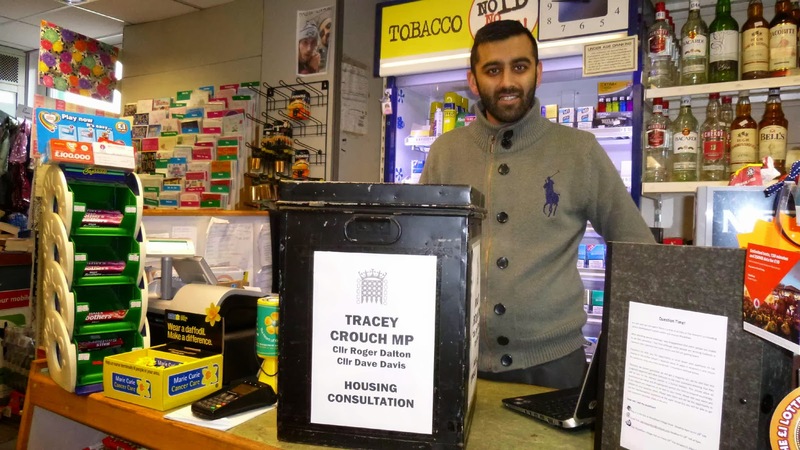 I am grateful to a small team of volunteers who delivered every house in the village this morning, and particular thanks to Jay Patel, who owns the Village Store and Post Office, who has agreed to have the ballot box on his shop counter for the duration of the "referendum". 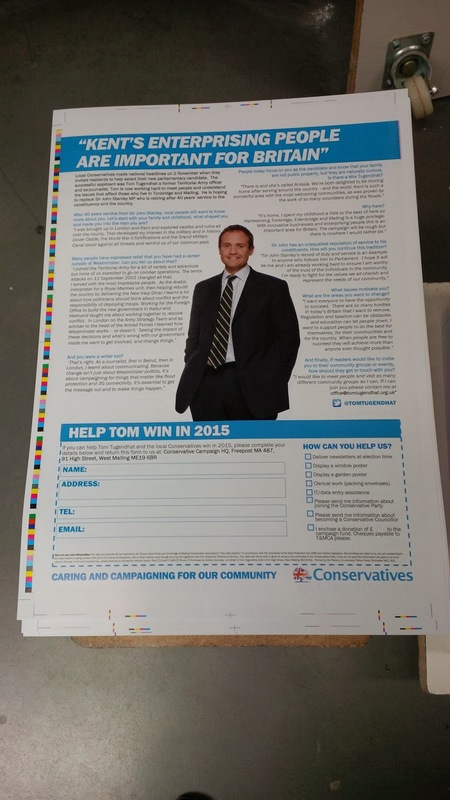 A few days ago I blogged about a borough-wide newsletter we are putting together for Tom Tugendhat with different editions for each of the wards, in total there are over 30 versions. The wards/councillors who always respect deadlines were given two weeks to supply their copy. Every single one did so, on time and without chasing. The traditional slow-pokes were given three weeks. Most required two reminders (one from me and one from the Group Leader) but copy arrived from them all. The third group (thankfully just four wards) were given four weeks. And guess what? Despite twice as long to produce words as the first group, and despite three written reminders, none of them provided their copy on time. 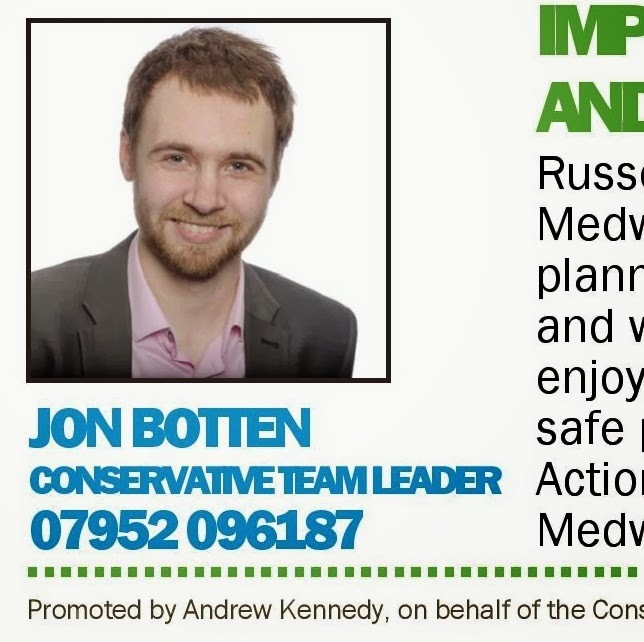 In fact one councillor has gone into hiding and we will have to print his leaflets with a blank space. Interestingly - they are invariably the same councillors who phone or email complaining about "the looming UKIP threat" and asking what "we" will do about it whilst simultaneously dragging their feet when given an opportunity to do something useful by communicating with their voters. I do wonder how they would feel if they turned up for the AGM to find I had 'forgotten' to book the room. Or arrived at a social event event to find I had 'overlooked' reserving a place for them. Or reached the day the Statement of Persons Nominated was published only to find I had 'misremembered' to submit their nomination papers. Or even found themselves disqualified because I had 'accidentally' deleted the email advising of the deadline for submission of election expenses. How we plug our books and avoid paying for the advertising! I will begin by saying that I like Dan Hannan - he's my type of Eurosceptic and I am delighted he is Number 1 on the list for the South East Region. That being said, sympathy with his views should not exempt him from the wrath of my Blog! A few weeks ago our five emails accounts all pinged at once. It was an email from Dan's office in Brussels asking us if we would "print off the attached pdf in colour and include one in each AGM notice being sent to our members." To put it mildly I was a bit irritated. Across West Kent we have 2,500 members. 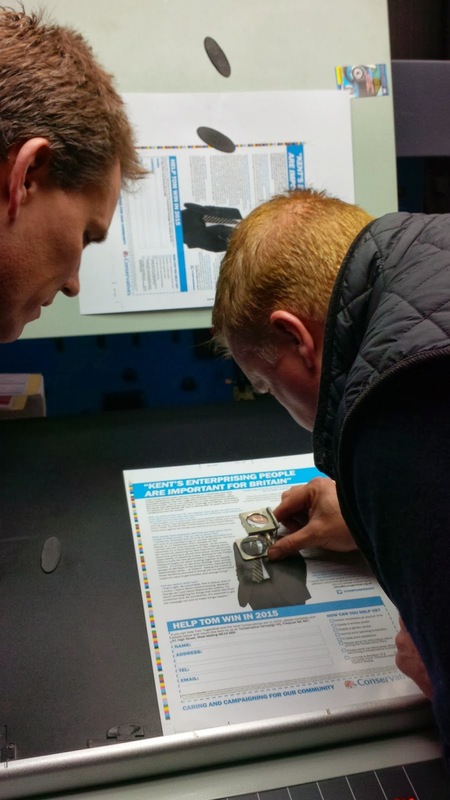 Printing and folding 2,500 leaflets incurs a cost - and adding them to an already full AGM envelope adds time. What really irritated though was he wanted them printed "in colour"! I don't print our own internal newsletters in colour as I am always conscious that every penny I spend is donated by our members. 2,500 colour A4 flyers would cost £130, which equates to the membership income from five members! I determined to print off a few hundred flyers and have them available at each AGM. But blow me, down last week someone from Dan's office called to "check we had printed them off and posted them out as requested". I explained to the nice man that I had no intention of spending £130 of other people's money, but said that if Dan would agree to cover the printing costs, I would be happy to help. This suggestion was declined. Clearly Dan was happy for me to spend our money on his propaganda, but not his own. Instead I was told that his office would send me a supply of colour leaflets to distribute. The leaflets arrived today. 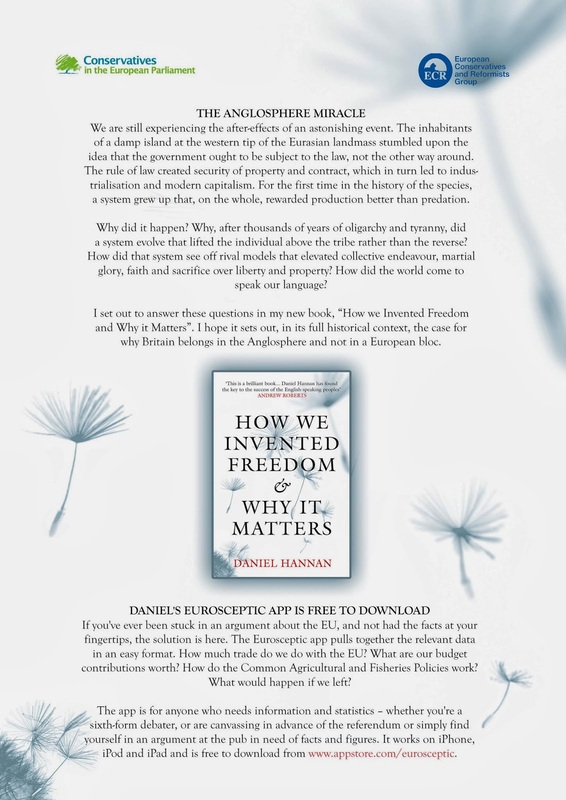 They are an advert encouraging members to buy Dan's latest book "How we invented Freedom - and why it matters". The books are £13.40 from Amazon. Come on Dan ! I am all for the free market, but expecting your hard-pressed Associations, who are all struggling to raise money to finance the EU election campaign, to pay for the printing and postage to promote sales of your book really is a bit much. Even Jeffrey Archer donated the profits! "Sorry I am late, but I am on a residential sharpening course. My wife does like to work with a nice sharp tool. As do I." Not really a lot you can say to that, is there? Apparently I have caused great offence. Last night's post was inaccurate. The delightful mollusc which appeared at West Kent Towers yesterday was not a Ethiopian Albino Sea Slug - but rather a Giant African Snail. 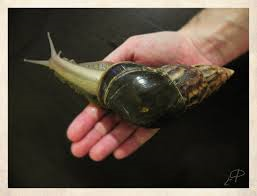 I would like to unreservedly apologise to all Giant African Snails for any offence caused. Declining Osmosis with an Ethiopian Albino Sea Slug! My day began with an 8am meeting at Hadlow Manor Hotel to discuss the launch of Tom Tugendhat's Business Forum. Back to the office for an hour's catch-up with Jon (who brought-in a strange cloth-covered box). "What's in the box?" I enquired nonchalantly, not quite prepared for the answer. It was an Ethiopian Albino Sea Slug. Jon whisked off the cloth with the theatrical dexterity of Debbie Magee, revealing a small fish tank containing the most ugly white slug imaginable. "Why have we got it in here?" I asked, trying not to portray my distaste at being eye-balled by a slug. Apparently it was his girlfriends 'pet' and it was in transit. He then tried to convince me it was "cute". This included an offer of putting it onto my hand along with some water so I could see and feel the ghastly thing drinking the water via osmosis. To be honest I could think of nothing I would less wish to do at 9.30am on a Monday than have a slimey slug sucking water off my hand. The slug was banished to the attic (with the folding machine and Tracey Crouch's unused correx posters) along with a threat "an unplanned rendezvous with the the salt cellar". Having gone through the days priorities and signed-off the AGM report with the T&M Chairman, it was a dash to Tunbridge Wells for coffee with a former member who has decided to become active again, and a chat on how the Association could best utilise her talents. 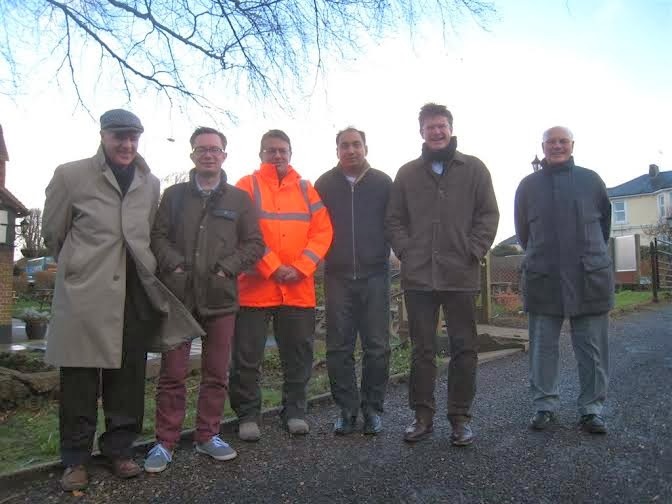 From there it was to Tonbridge railway station to collect Tom Tugendhat for a visit to a local factory making polymers, 90% of which are exported. 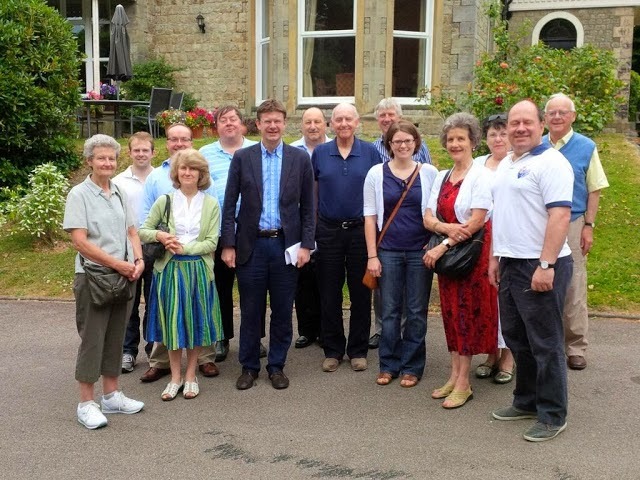 Then to Crowborough for a meeting with a donor and back to Tunbridge Wells for a Management Committee immediately followed by the Executive Council, the highlight of which was Greg Clark MP being re-adopted as Conservative Parliamentary Candidate. Finally leaving TW at 10.15pm for the hour long drive home. As I sat in the car I glanced at my Blackberry, flashing menacingly on the seat beside me. The "unread email counter" showed 87. Something to look forward to in the morning - before I meet with the IT people who will be installing the new Phone Bank into West Kent Towers. 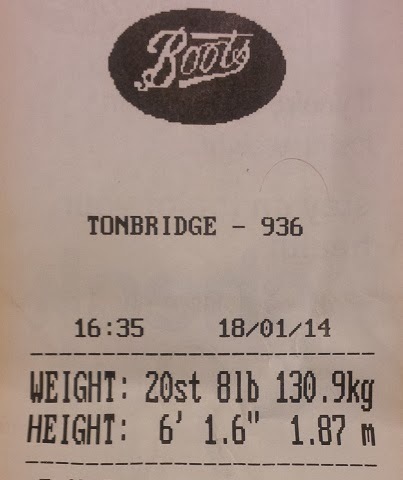 Following a two week period when my leight remained stable, I was back on track today with a lovely 6lb loss. This brings me weight down to 19st 5lb. 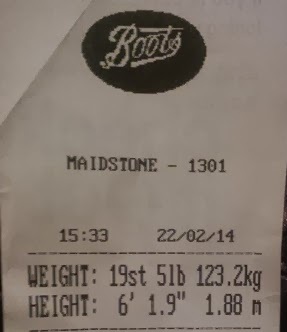 In total, I have lost 2st 5lb since I started my diet on 1 January. 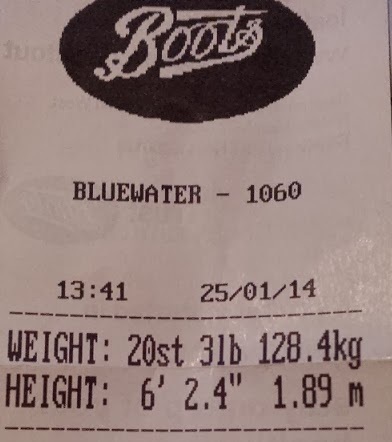 Nicely on track for my 4 stone target by end May. Opening a second front - with much more in reserve ! 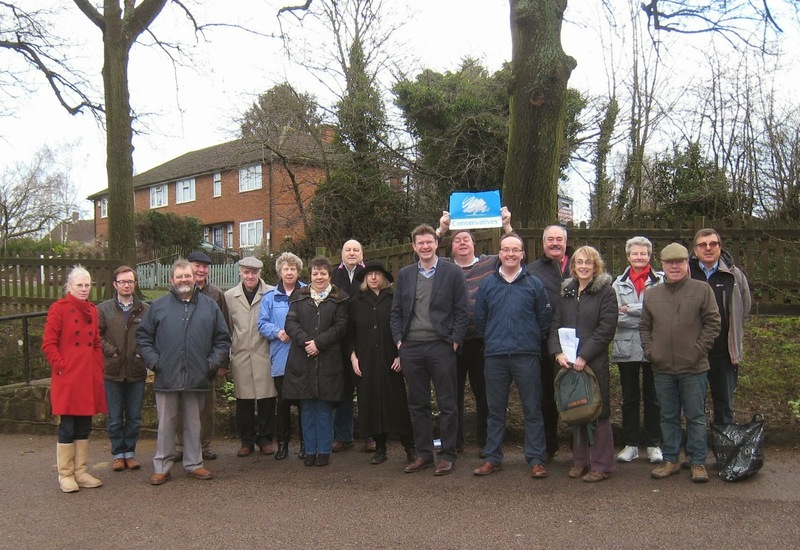 Two campaign teams were on the streets today - a group of twenty on the attack in an opposition-held ward in Maidstone and fifteen campaigning in Tunbridge Wells. 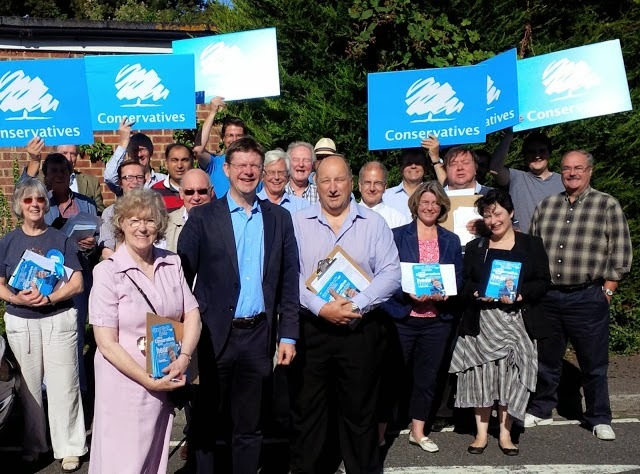 Greg Clark led the Tunbridge Wells team with neighbouring MP Tracey Crouch bringing two car loads from Chatham & Aylesford to support colleagues in Maidstone. My thanks to all 35 activists for their support. Today has been one of those days when I have gone from one meeting to the next whilst at the same time trying to manage "a little local difficulty" which is is blowing out of all proportion. Today's issue resulted in probably 20 hushed phone conversations between the various participants, often conducted in coffee shop lavatories where I assumed I wouldn't be heard. Apart from Finch House where, having told one participant exactly what I thought of the situation, I was then dismayed to see someone coming out of a cubicle - having clearly heard every word. The old man looked at me suspiciously, before saying with a smile, "from what I've just heard I'd chop his balls off too". Oops! The day then got odder. My next two meetings were with two different ladies who had each been in touch to offer help. Sadly, I had never met either of them before nor had they met me. This resulted in me going up to various single women and asking "hello, are you xxxx". Let me give you some advice - approaching well dressed ladies in suburban Tunbridge Wells and announcing "hello, I am looking for Joy" can attract some strange looks. When I finally returned to the office Jon was also looking a bit frazzled. Apparently the man who writes to the Party Chairman to complain that I wear suede shoes on a Tuesday had been on the phone, as had the man whose movements are monitored by aliens via a transmitter in his teeth, and the man with an ear trumpet who sits at the back of meetings and complains he cannot hear. "What did they all want", I asked. No idea, said Jon. They all wanted to speak to you so I suggested they call back on Monday. I am not sure what happens elsewhere, and I would actually welcome feedback and comments from other Associations, but I have always felt there is a better way for us to interact, at Association / MP level, with our local business and SME (small and medium enterprise) community. Traditionally an MP has had a Business Group or similar. In my experience these normally consist of a small number of Conservative-inclined business people who donate not insignificant sums to be a member of the local Business Group (just as we might have a CF group for younger members of a Women's Group for women!) In exchange for their contribution they are invited to a number of dinners or lunches with business-inclined guest speakers. Bringing people together with a shared interest is a perfectly legitimate way to operate and raise funds - all parties do it. My problem is that these groups are seldom inclusive. The entry price is often too high to the exclusion of many SMEs, and fewer people now want heavy five course dinners at the end of a busy and stressful business week. 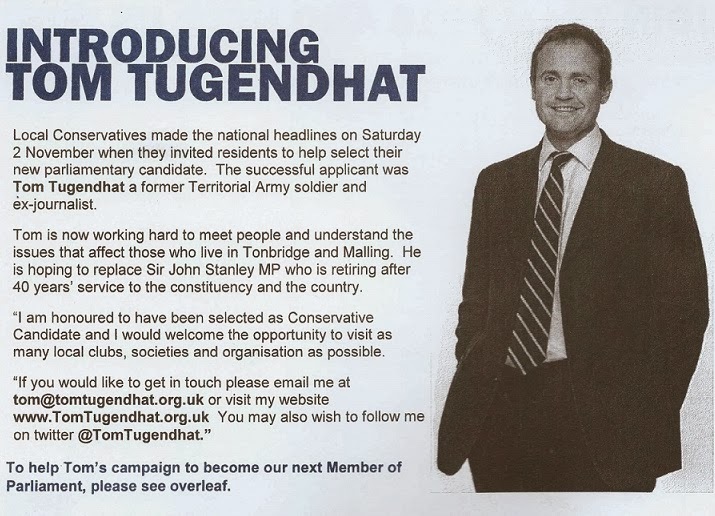 I am therefore pleased that Tom Tugendhat in Tonbridge & Malling is approaching things differently. Rather than having a small group of pro-Tory business people, we are just about to write to over 1,000 businesses in the constituency, the vast majority of them being SMEs. Over recent weeks I have had a team of volunteers trawling through Yellow Pages, various business directories and even driving around small industrial estates and high streets gathering business names and addresses. The list contains small shops to farms, garages and workshops to factories and offices - and everything in between! Everyone of these businesses will be invited to a complimentary business breakfast with Tom. We are hoping for in excess of 100 guests. Once they have met Tom and hopefully enjoyed a good breakfast, we will invite them to sign-up to his Business Forum, with a very modest entry price of perhaps £20 to cover our admin and postage costs; well within reach of even the smallest business if they wish to join. In exchange for the payment they will receive a twice-yearly newsletter from Tom plus invitation to regular low-cost business-friendly networking events, such as breakfasts or post-work drinks with relevant guest speakers. We believe this new model will actually benefit the business community; bringing people together and providing our Conservative candidate with a vital insight into the needs of the local business community. As always I will keep you informed. 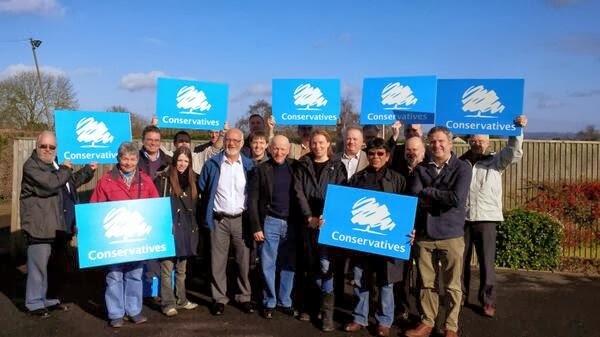 West Kent have a proud tradition of providing Campaign Support for by-elections - with full coachloads attending Eastleigh, Norwich and Crewe and Nantwich. 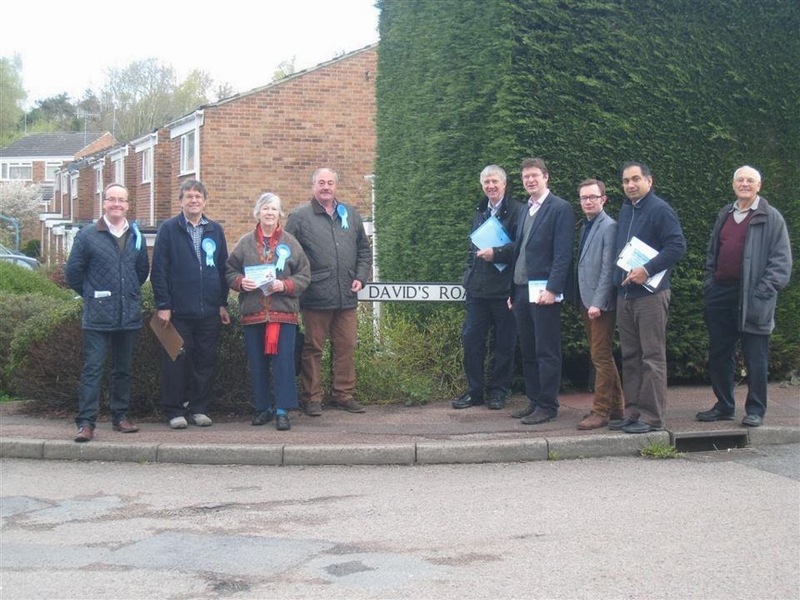 We also adopted a ward for the London mayoral campaign - and help each other during local by-elections in Kent. We are therefore pleased to be supporting our colleagues in Eastbourne in their battle to regain the parliamentary seat from the Lib Dems in 2015. Our excellent candidate is Caroline Ansell, whose website may be found HERE! Our first coach party will be on Saturday 7 June, with pick-ups at Bluebell Hill at 8am, Hilden Manor at 8.30am and Tunbridge Wells Constitutional Club at 9am. 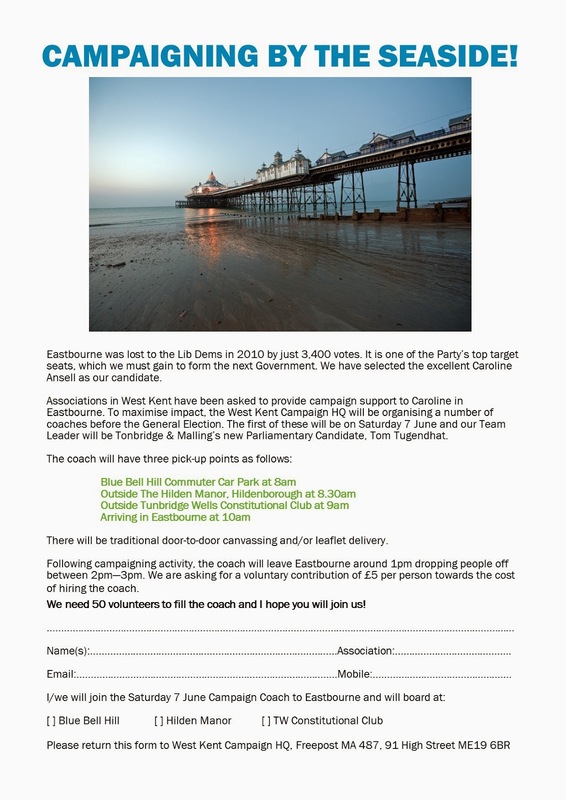 Upon arrival at Eastbourne there will be leafleting and canvassing. The coach will leave Eastbourne at 1pm arriving back in Kent just after 2pm. To book a place on the coach please phone the West Kent Campaign HQ on 01732 842794 or print off and return the above form. But Jon, can't you see it's the wrong type of green! One of the reasons West Kent Towers is so successful is the two people who work there complement each others strengths and weaknesses. Jon is detailed and thorough; perhaps a touch pedantic; never happier than when he is maintaining the membership database, updating the standing order spreadsheet or balancing the petty cash. Whereas I live in a world of creative chaos, constantly re-inventing the wheel and challenging the status-quo. The former chairman of Chatham and Aylesford once said, "your problem Andrew is you cannot see a sleeping dog without poking it with a stick to see how angry it will be when it wakes up." I wish I could disagree! This different approach comes to the fore when we have a leaflet to design. Like today. AK: Jon, we must get going on the Borough-wide newsletter. Jon: "OK, what's it about?" AK: Oh I don't know. Let's not worry about the words, we must focus on the design concept. I want it to give the message of change; grab the season - spring - new hope and optimism. AK: A bit like crocuses and daffodils poking through the snow. I want it to draw a line in the sand, use the onset of spring to focus on hope and change. Jon: "You want it to focus on the crocus?" The first stage is what I call "designing the coat hanger". 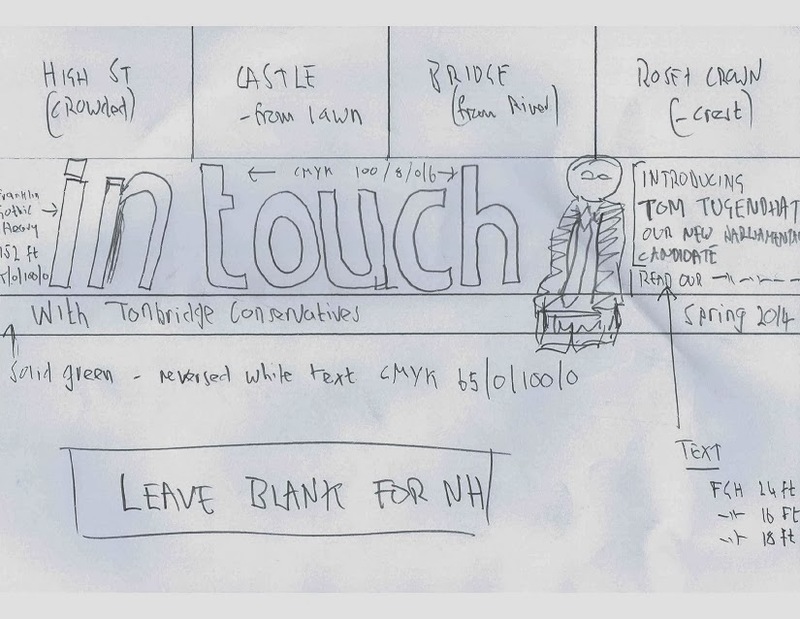 This is the basic design into which the MP / PPC and local councillors can "drop in" their local copy. Depending on the constituency there can be up to 35 editions, further complicated by the fact that constituency boundaries cross borough boundaries, so the borough council words must change as well as each ward. So begins the long and tortuous process of "designing the coat hanger" working from a rough sketch scribbled on paper along with my verbalised "design concept". AK: I want the leaflet to reach out Jon. JB: "What do you mean by that?" AK: It must reach out and welcome in. The banner must be vibrant and grab hold of the reader. Jon: "It's a bit of paper"
AK: Oh Jon, you're such a Philistine! Slowly and painfully it takes shape as we bicker over every line, dot and comma. AK: That's looking really good Jon, but I am not sure the sub-headlines. Jon: "What's wrong with them?" AK: They're the wrong shade of green. Jon: "Green's green. They're green - you said you wanted them green, that's what they are." AK: No, no, no Jon. I said I wanted it to convey hope and optimism and the spirit of spring. That's the wrong green. That's mushy-pea green, not hopeful green. Can we try different shades of green?. At this point tempers start to fray and Jon gets snippy (not that I blame him). Jon: "Is this one better?" "What about this shade of green, does that suit you?" "How about this shade, does that fit in with the 'integrity of your design concept'...? AK: Now you're being sarcastic. AK: That's it Jon, perfect. Jon: "It looks the same as all the other shades of green to me." 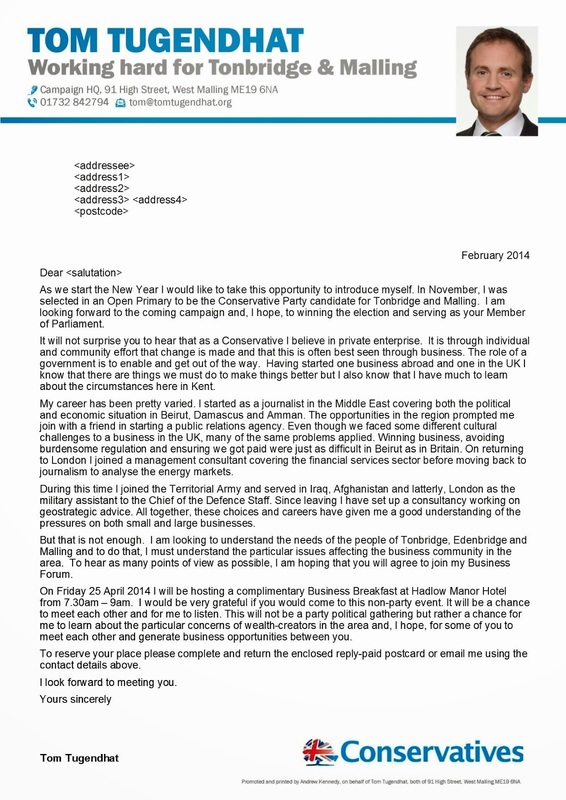 AK: I'm not sure about Tom Tugendhat's position of the page. I was hoping he would be standing in front of the solid green line. AK: No he isn't. He's more plonked on the green line than standing in front of it. Jon: "Look, he is in front of the line." AK: No he isn't. I can still see the white surround. It needs to be transparent. Jon: "How do you do that?" AK: Oh, I don't know. Try clicking on Tools. Click there, no there, try that three up from the bottom, no up, you've gone too far. Go back, go back." Jon: "I can't see where you're pointing, your hand is in the way." Finally, the page comes to life. Between us we have created a document which conveys the hope of the coming season. It reaches out and welcomes in. It has the perfect shades of green and most importantly Tom Tugendhat in standing in front of the solid green line. Now all we have to do is nag 50 recalcitrant councillors to provide their copy, correct the spelling and grammar, edit the words to fit into the space, airbrush their photographs, produce 35 different editions, arrange for 45,000 copies to be printed and folded and then send it to the branches for delivery. But that's all quite simple by comparison! "it's all about the integrity of the design concept!" 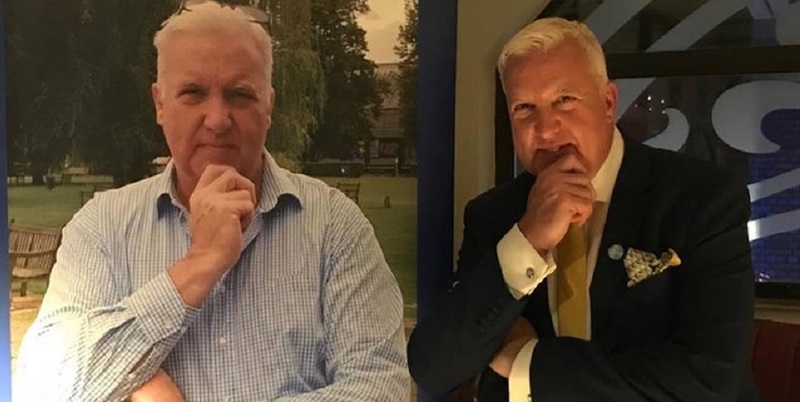 Many people have been in touch throughout the day asking if they could see the "Book of Memories" the Association produced and presented to Sir John Stanley at last night's dinner. (ii) it was technically a difficult process as it is a large hard back book and not simple to convert into a format which I could digitally publish. However, every problem has a solution. I scanned each page then turned them into jpgs, edited the jpgs to remove tributes which were private or personal, then reconfigured the pages into a book which I published via ISSUU. Simple! The quality if not great (it has gone from a hardback book to online via a scanner), but readers can see what we have done and read most of the tributes. It also provides a lovely overview of the constituency, with many photographs of our lovely towns, villages and rural parishes included. Like the first cuckoo heralds the arrival of spring, so the first "you only ever come around when you want our vote" indicates the arrival of local elections! It was said to me for the first time in 2014 last week! So here, for the record, is proof that Conservatives really do work all year around! You can tell from the coats, hats to umbrellas to t-shirts and shorts that we really are out and about in all weathers! 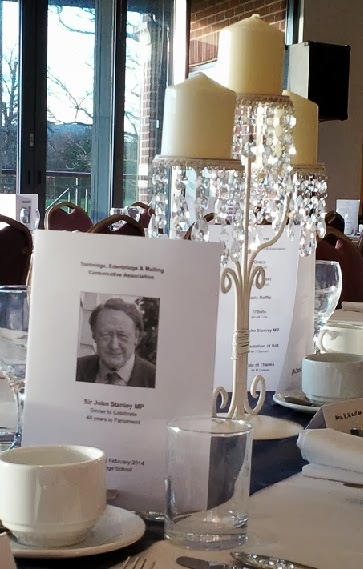 Tonbridge & Malling Conservative Association gathered tonight to mark the 40th Anniversary of Sir John Stanley's election to Parliament. 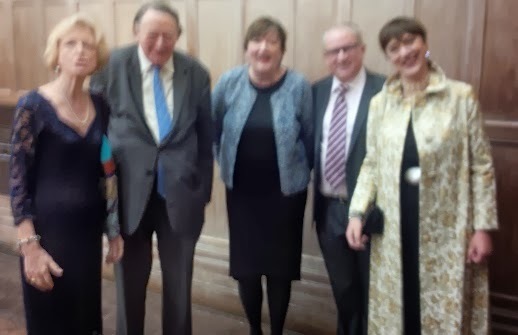 Over 220 guests (from 12 - 95 years of age) joined members of Sir John's family, his personal friends, Parliamentary and constituency staff and his previous (and current!) Agents at a magnificent dinner at Tonbridge School. The menu was poached salmon with avocado, locally reared beef fillet with beef cheek, fondant potato and seasonal vegetables and lemon tart. After the meal, Mrs Marion Cole delivered the vote of thanks to Sir John, highlighting his service to party, government, country and constituency since 1974. "People today may not remember how dangerous things then were, especially as the Prime Minister's PPS and then as Minister of State for Northern Ireland. My predecessor, Airey Neave, was murdered by the IRA as was my successor and friend, Ian Gow. The pressure of living with the security and the constant threat was enormous, but they supported me throughout and I couldn't have done it without them." 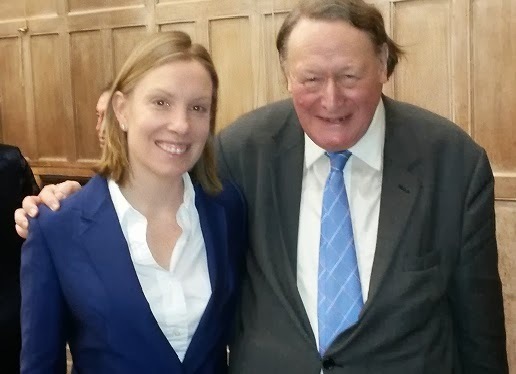 He spoke movingly about the support he has received from the local Association, highlighting two important points, which are sadly lacking in many organisations; (i) the Association has never split nor been driven by factionalism or internal divisions, and (ii) It has never been disloyal nor stabbed him in the back or tried to undermine him. "As a Minister, especially in Northern Ireland and Armed Forces, I lived daily with the horrors of the world. Death, destruction and torture, often so commonplace that they didn't even warrant mention in the news. 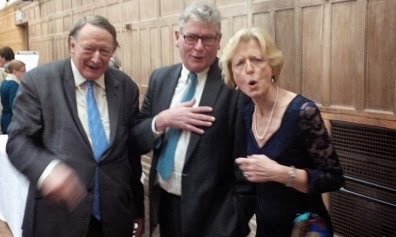 Yet through all this I knew that back home in Kent I could rely on the loyalty and support of my Association; who accepted that their MP had duties which took him overseas, and who never tried to undermine what the government was trying to achieve. No matter how difficult things were I always looked forward to coming home to Tonbridge & Malling. Quite simply, your friendship and support made it possible." It was a truly moving speech from a man who hails from a generation of politicians not known for showing their emotions in public. At the conclusion of his speech every person in the room stood and clapped for three minutes, and deservedly so. Sir John presented the Association with a wonderful gift to mark the occasion. 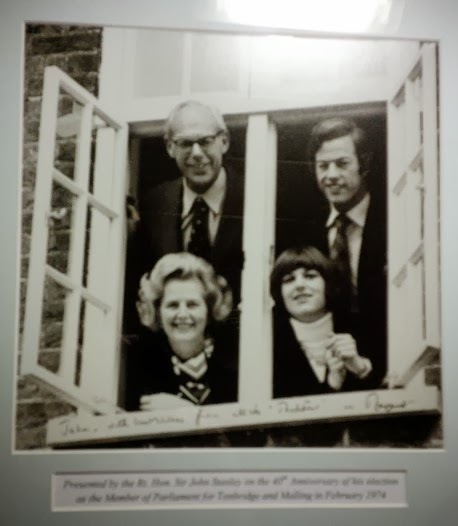 It was a framed and signed photograph given to him by Margaret Thatcher in 1979 when he was her PPS. The Association in turn presented Sir John and Elizabeth Stanley with a number of gifts bought from a fund provided by the membership. These included tickets for the Royal Opera House at Covent Garden, dinner at Wilton's Restaurant and hard-backed book containing the memories and recollections of the members accompanied by photographs of each town, parish and village within the constituency. 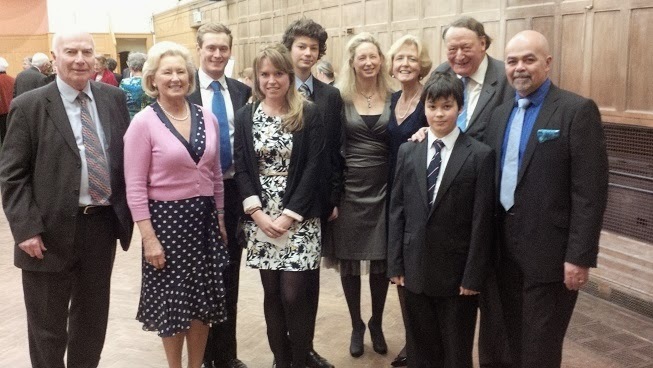 Sir John with his family - including his children and grandchildren. Sir John's dedication can be read below. 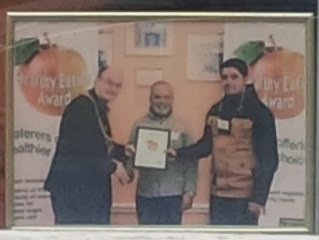 The photograph will hang with pride in our new office in Paddock Wood. Peoples' rudeness and inconsideration never ceases to amaze me. 2. Someone else has emailed to say his original guest cannot come and his new guest will be (Mrs X); but can I give him an assurance that I will rewrite the place card and the seating plan so his new guest does not see the name of the woman whose place she has taken, as it might cause her offence. 3. A third member sent me a text last night to say "I have just seen who else is sitting on my table, I know it's late but could you pop into the office on your way to the venue tomorrow and redo the seating plan." All three requests have been met with the response they deserved. Aviva could teach British Airways about good customer service! Regular readers will know that a school minibus reversed into my car two weeks ago. To cut a long story short, a few hours after the incident I received a call from Aviva who are Kent County Council's insurers. The caller introduced himself by name, explained the process and gave me a direct line and email address should I need to contact him. I was asked to provide a written quotation to repair the damage, which I had to email with a couple of photographs, which I did three days later. Each time I emailed with a question I received a reply within a couple of hours; the replies were well written, courteous and accurate. I was kept informed of progress, and yesterday received an email to inform me that the car was repairable but offering me an option to write it off. The 'write off' figure was very fair, and whilst a friend advised me to go in higher to try and up the offer I decided to settle. I am sure I could have pushed them for a few hundred pounds more, but in the end I felt I had been treated well, their offer was decent and I was happy to bring the matter to conclusion. Had Aviva treated me badly, or their Claims Manager been arrogant or condescending, or failed to reply to my emails, I would have probably been a bit more combative and tried to maximise my claim. As it was, I felt I had been treated well and was happy to settle without rancour or argument. I suspect some might consider me foolish for showing such benevolence to a multi-national insurance company, but I am happy with the outcome and like to treat people fairly. It's a shame that receiving good service is so rare that I consider it worth blogging, but sadly that's the way of the world. Given I am happy to complain when things go wrong, it's only right to acknowledge when they go well. So thank you to Aviva and to their Commercial Claims Manager, Daniel Hipperson. I have emailed his line manager to express my thanks, which I am happy to do in public on my blog! 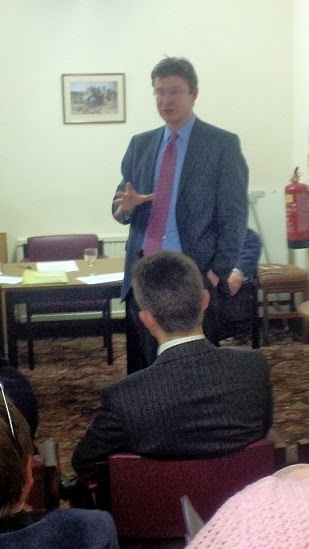 Nigel Farage brought his one-man semi-comedic roadshow to Tunbridge Wells last evening. Never one to underestimate his own popularity, he booked the largest venue in town; the 1000-seat Assembly Hall. Posters were displayed, flyers distributed, the press were primed and UKIPs pinstriped pamphleteers were sent out onto the streets to drum-up support for the arrival of the Messiah of Sevenoaks. I have the figure. 223 people in Tunbridge Wells went to see Farage at the Assembly Hall. Tickets were £21.50 a pop. Sadly, fewer than 25% of the seats were taken. The Great Man recited one Daily Mail editorial after another to crowd more akin to a cult than a political movement. 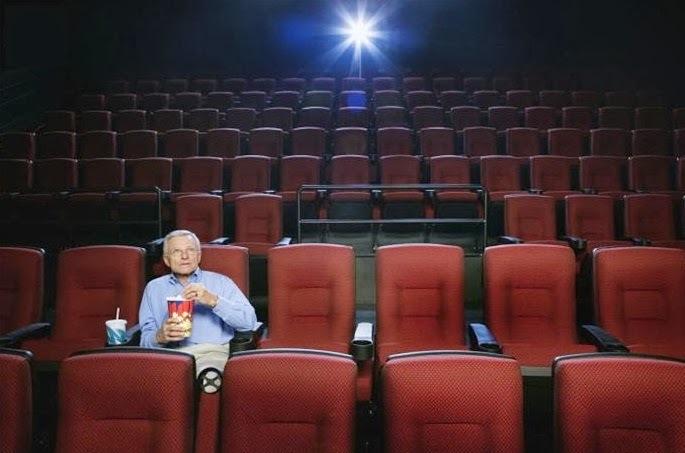 Empty seats are nothing new to UKIP however, as seasoned watchers of the European Parliament will confirm. UKIP MEPs have one of the worst attendance records at Strasburg, claiming every penny they can, whilst seldom turning up for important votes to defend Britain's national interests. Mr Farage has one of the worst attendance records; only four MEPs rank below him. Perhaps he is too busy shouting at empty chairs in the Home Counties to do the job he is paid for! I am rapidly reaching the view that traditional branches, based on ward boundaries, have probably had their day. This doesn't mean that where they are successfully established or thriving they should be wound-up or neglected, but we must never be afraid to seek other ways to engage people in the process. When I grew-up in Wallasey in suburban Merseyside, our road of modest post-war three bedroom semi-detached houses were occupied by a stable community of long-term residents. Forty years later I can still recall the names of almost every family in the road. In a society where people "settled down" in their dream home, worked, shopped, socialised and worshipped locally and remained in the house until their grandchildren put them into Twilight Lodge, it is hardly surprising that neighbourhood boundaries were important markers. Today, however, this is not the case. For many, home is a place to sleep not where you would choose to settle. Job market fluidity, social mobility and changes in lifestyle result in even those who can afford to buy not doing so until later, or 'buying to let' as an investment whilst continuing to rent or share with friends. Steve and I have lived in four homes since we moved south, and this is far from unusual amongst our friends. At our longest period of residence, the five years we lived in Bromley, we knew the names of just two of our neighbours. In an increasingly peripatetic world it is little wonder that people are reluctant to join a committee when the only bond is a random local government ward, the boundaries of which are usually drawn by the pen of a remote 'commissioner' with more interest on numeric quotas than community. Think about your inner and outer circles of friends and acquaintances. Who are they? Are the people you spend your free time with drawn simply on the basis of geography? Or are they people with whom you share an interests? If you were invited to an event with a random cross-section of people who just happened to live in the same "north east" corner of your town would you bee more or less likely to attend than if you were invited to an event with a group of people who shared a hobby or vocation? If I was invited to a meeting of boat owners, or inland waterway enthusiasts, or lovers of Gibraltar, I would almost certainly go as I would know that I had something in common with the others; I would be able to hold my own in conversation and contribute to the discussion. Surely most people would feel the same way? That is why in Tonbridge & Malling we will be investigating ways in the coming year to launch new branches based on shared interests rather than simple electoral geography; and there are so many potential groups to work with. Young professionals, city commuters, farmers and growers, SMEs and so on. Surely our aim is to bring people in? Will it not be easier to attract and retain people if they know they will have an opportunity to network with others who share their interests and with whom they would choose to mix with? And won't it be easier to encourage them to bring along their friends if they know the events will cater for their interests and the speakers will be relevant? None of this means that we should abandon the traditional branch, but in order to prosper we must start welcoming people on their terms; not rejecting them as they are not willing to join on our terms. I blogged yesterday about our missed flight to Gibraltar due to a standstill on the M25 resulting in a four hour journey to travel 50 miles and BA insisting on us paying nearly £600 to transfer our tickets to this morning's flight, which we reluctantly paid as no other options were available other than losing our holiday. Surely nothing else could possibly go wrong. So last night, rather than spending an evening at our favourite table at The Rock Hotel overlooking the twinkling lights on the Bay of Gibraltar, we were instead in cold and rainy Swindon, eating Tuna Pasta Bake at my (tea-total) Mother-in-Law's house. Mustn't complain; she's a lovely lady and it was good of her to put us up at short notice, and Swindon is closer to Heathrow than Kent so we didn't have quite so far to travel this morning. Up at 6am and on the road by 7am and (all to plan) we arrived at Terminal 3 by 8am. Onwards to check-in. "Good morning Sir, I am afraid the BA 490 to Gibraltar has been cancelled today. But don't worry, we have instead booked you on to the BA 492 to Gibraltar, which leaves two hours later at 11.50am." We gritted our teeth and said nothing; after all it's not the fault of the charming man at check-in (memories and angry ranting people on the "Airport" documentary always come to mind at times like this). We enjoyed a leisurely breakfast at some faux-French bistro with bentwood chairs, I even smile benignly at the pompous waiter who refuses to bring English mustard as it's a "French" bistro (but happily offers me HP sauce) and ask each other why people feel it necessary to order pints of lager at 9am just because they are at an airport. We board the flight on time, and as we taxi to the runway the Captain comes on the PA system. "Welcome Ladies & Gentlemen, bad news I am afraid. Cross-winds coming off the Atlantic have resulted in it being impossible to land at Gibraltar today, we are therefore diverting this flight to Malaga, where our Ground Agents will lay on a coach to transport you back to Gibraltar." My heart sank. Having lived in Spain for a year (actually just outside Malaga) I knew only too well how efficient Spanish transportation can be. And my worst fears were not wrong. We landed roughly on time, but then had to wait 15 minutes whilst the airport found a staircase for us to disembark. Having found a staircase we were not allowed to disembark as they couldn't find a bus to transport us to the terminal. Finally we were allowed off. Spanish customs were their usual welcoming selves. No-one from BA nor their Agents told us what was happening. We finally found a women who was holding a hand-written sign "BA redirection follow to lower ground floor and board coach at Bay 14). The sign was written in Spanish and she didn't speak a word of English; fortunately someone we had befriended knew sufficient Spanish to understand what was happening. We boarded the bus and waited. And waited. Then we were told that we should have collected our luggage (no-one told us we had to). Off we all got and traipsed back to the arrivals hall. There was no signage and no-one to help. We finally found our luggage piled-up in a corner. Returned to the coach and waited. It was now nearly two hours since we landed and the coach hadn't left or even looked like it ever might ever do so. Then a lady who resembled Tubbs from the Local Shop in Royston Vasey appeared and handed-around a print out. "Find your name and cross it off" we were ordered. The list wasn't alphabetical and the passengers were spread across three coaches. It was a slow and painful process. About 20% of passengers couldn't speak English and had no idea what they were been told to do. Another 20% who lived in Spain had escaped and caught taxis home. The exercise was therefore pointless and no-one actually knew who should be there and who had escaped this living hell. At one point some clipboard carrying Spanish bureaucrat actually boarded the coach an announced, "if anyone who should be here but isn't here and who have not crossed their name from the list, please make themselves known to us." The absurdity was beyond parody. Finally we set-off and the journey isn't too bad. We befriended a Royal Navy officer is the seat ahead who had flown out to join the nuclear powered warship Britain has sent to Gibraltar to growl at the Spaniards over their border delays. He was in touch with his ship who texted to say, "Spanish border police playing up again - 90 minute delays at the Frontier". Finally, we arrived at Gibraltar at 8pm - 12 hours after arriving at Heathrow and 38 hours after leaving home. Several years ago I recall visiting Gibraltar in the lead-up to the second referendum on sovereignty, when 98.7% voted to remain British. Every taxi was bedecked with posters bearing the message GIVE SPAIN NO HOPE. I remember being taken aback with the brutality yet simplicity of the message - four words managed to sum it up nicely. As our taxi pulled away from the airport and drove passed a gaggle of gun carrying Guarda Civil our driver wound down his window and shouted, "Chuppa mis lluevos". I couldn't possible comment! Footnote; our faith in human nature and our love of Gibratar was restored as soon as we arrived at The Rock Hotel. On check-in the receptionist confirmed that despite pre-booking three nights we would not be charged for our missed night's stay as "our non arrival was not our fault and they value our custom." If only British Airways treated their customers with similar respect and understanding. I was hoping to be blogging from the terrace of The Rock Hotel, overlooking the Bay of Gibraltar. Instead I am writing from my mother-in-law's spare bedroom in Swindon. Having left home at 6am to make a 90 minute journey to Heathrow, we were still on the M25 four hours later. A combination of roadworks, a road traffic accident and floods closing the M40 resulted in standstill. At one point it actually took us an hour to travel two miles. Realising we would miss the flight I checked BA's website and found there were still seats on tomorrow's flight and these were being advertised at £140 each one way. £280 was a bit of a hit, but given we had already paid for our hotel and were both desperate for a break, it was a price worth paying. Before I start, I will put the following on the record. 1. It's not BA's fault that we missed our flight - I am not blaming them nor expecting favours - it was bad luck and no-one was really to blame. 2. Having booked the lowest cost seats we could I didn't expect BA to change them at no charge, they are a business and owe us no favours. I called BA to inform them that we wouldn't be travelling today and to book (and pay for) two new one-way tickets for tomorrow. The booking agent confirmed availability, but then said, "if you book two one-way tickets how will you return?" I confirmed that we had already purchased two return tickets and that we were booked onto Monday's flight from Gibraltar to London and that we would return on the scheduled flight we had paid for. "Sorry, if you are a no-show for the outbound flight you are removed from the return flight." In other words, despite having paid for our ticket, the fact we missed the outbound flight we would not be able to use the (already paid-for) return flight, onto which we were already booked. Just think about this for a moment. Our seats on the outbound flight this morning were paid for. Having informed them we would not be traveling, BA lost no revenue. In fact, we probably saved them money; they didn't have to handle our bags or pay for the fuel two additional passengers would have used. In fact considering BA overbook most flights, our no-show might have enabled them to offer our seats to someone who would have otherwise been bumped, thus saving them compensation. But there was no negotiating or reasoning with them. The situation then got worse. The only way we could use our return tickets was to "amend" our existing booking so we could fly tomorrow instead. Running out of options I had to agree. The cost? £580. That's right: £580 to change a booking (when we could have bought new tickets one-way for £280). In total, we have now paid BA over £800 for two economy tickets to Gibraltar. But if this woeful tale isn't bad enough, it gets worse. We decided to stay overnight at Steve's parents in Swindon. When we arrived I checked the email to print off our new departure details only to find we had been booked onto the wrong flight! You really couldn't make it up. I called BA again - went through the whole situation, only to be told "if you want us to make changes there will be another charge." Fortunately, they backed down, although their booking agent told me it was a "special favour". I would be interested to hear from anyone at BA's Customer Service why not being penalised for their staff making an error should be regarded as a "special favour". What a bizarre way to treat your customers! Steve and I are not frequent travelers, we fly perhaps two or three times a year. However we always fly BA on the basis that paying a premium compared with budget carriers we thought we would receive better customer service. The service we have received from BA today is little better than I expect from Ryan Air or Easy Jet. I am a very dissatisfied customer. 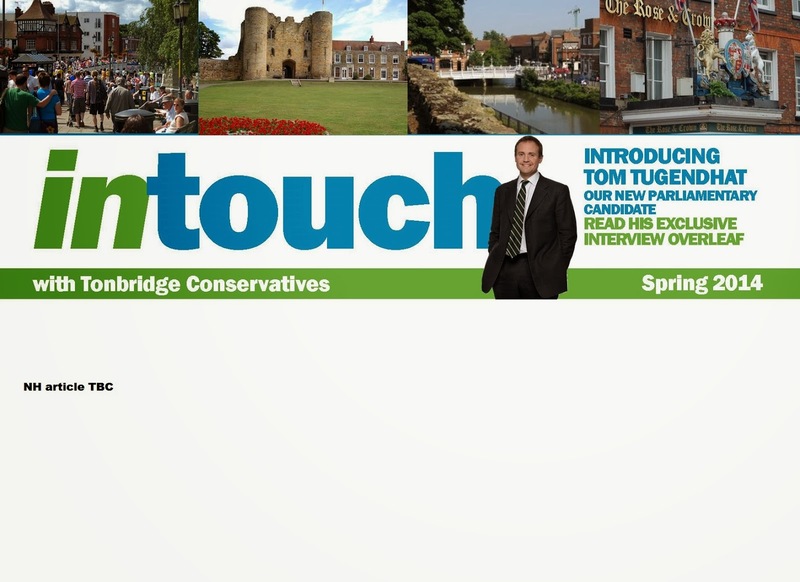 Our excellent PPC for Tonbridge & Malling, Tom Tugendhat, will be standing on Tonbridge bridge (opposite Pizza Express) on Saturday morning betweem 10am - 12.30pm "meeting and greeting" residents. Our new pop-up banner is ready and my last job before leaving the office tonight was to print 1,000 Introducing Tom Tugendhat postcards. Good luck to Jon, who is organising the event, and thank you to our local volunteers who are coming along to help. I am off to Gibraltar tomorrow for four days, where sadly the whether is little better than it is here. 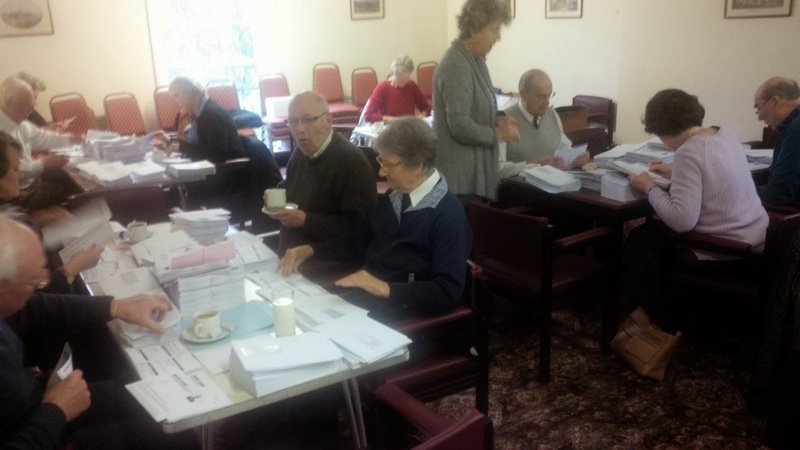 I am conscious that there are only so many words and photographs to illustrate envelope packing, but after Tuesday's marathon in Maidstone with over 60 helpers, it would be wrong not to record thanks to today's team of 24, who packed 12,000 envelopes in Tunbridge Wells today. Over the last three days we have mustered 90 volunteers who have, between them, packed 40,000 envelopes. What a great team ! No, not that Dave. I'm talking about Dave Davis. No - not that Dave Davis (MP for Haltemprice & Howden). I'm actually talking about Dave Davis, local Councillor for Burham Eccles & Wouldham Ward in Tracey Crouch's constituency. Driving to Tunbridge Wells this morning, having picked up Jon Botten from his home, we stopped at traffic lights in one of Tonbridge's less grand roads. Suddenly Jon let out a strange yelping noise, a bit like a spaniel would make when someone opened the cupboard where the marrowbone treats are kept. "Worshipful Dave says we have the best Vindaloo in Tonbridge Town." I am full of admiration for people who dedicate a year of their lives to be a First Citizen of any town or borough. If ever I was elected to a council and offered the position, I would have to refuse. In fact, I would let it be known beforehand so I was never asked! I simply couldn't do it. I struggle to be nice and charming for two consecutive hours; the thought of having to do it for a year is simply beyond comprehension. I once asked a friend who had served for twenty years and had looked forward to his Mayoralty whether he had enjoyed it. He smiled ruefully and said, "the first four weeks were delightful." And what was the low point? "Five hours of madrigals with a ten minute refreshment break." On another occasion I arrived at a local council office for a meeting with the Group Leader. As I walked along the front of the building I could see into the civic suite, and there, elevated on a high stool, was the Mayor. She waived cheerfully. She was surrounded by hundreds of primary children and someone was reading aloud "The life cycle and history of newts in the ponds and waterways of Kent." I left the building 90 minutes later, and the poor old woman was still there. By now someone was strumming a guitar and the children were signing about newts, toads and frogs. The Mayor, by now pallid and semi conscious, was clapping along with a rictus grin where her smile used to be. I thought, "she does this three times a day and all she gets is a cup of municipal tea and a plain digestive." 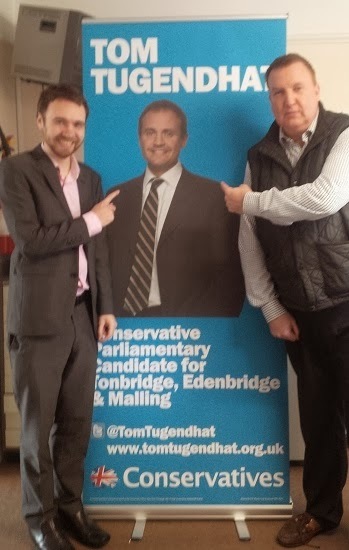 Tonbridge & Malling's Parliamentary Candidate, Tom Tugendhat, is a great guy. He is committed to the constituency, wholly reliable, popular with everyone he meets, and hosts very agreeable 'strategy meetings' with his agent in very nice restaurants. Sadly, the quality of the food often results in his agent not remembering what the agreed strategy actually was. 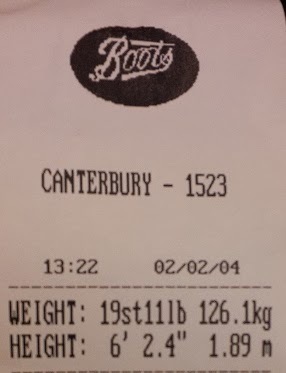 He is also very generous and was one of the first to sponsor me for my weight loss, for which I am very grateful. He knows I love food and appreciates the effort I am making to improve my health. 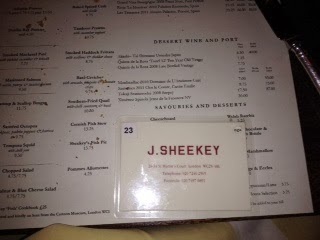 Then, a few moments ago he emails a photograph of J Sheekey's menu (one of my favourite restaurants) with this message"what would you recommend...?" Just what I need when my lunch today was a banana and a bottle of still water! I would recommend fish, Mr Tugendhat - but be careful you don't choke on the bones!